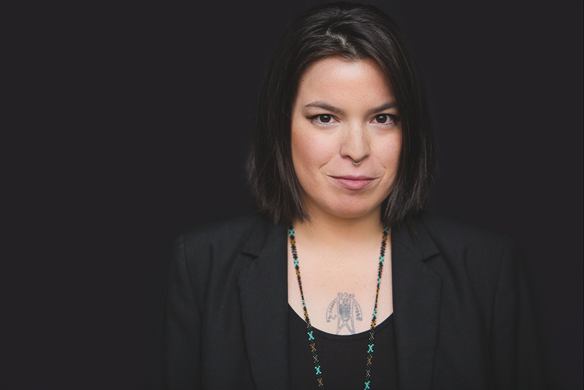 Natasha Kanapé Fontaine is an Innu poet and multidisciplinary artist from the North Shore of Kebeq born in 1991. In 2012, she becomes one of the voices of Idle No More movement in Kebeq. She uses slam poetry to write and speak up about indigenous issues and protests, publishing four collections of poems, and performing as a performance artist, an actress in plays and television, and poet speaker in conferences and poetry shows. After six years of solo work, enjoying collaborations with artists from around the world, she now works with Maori artist Charles Koroneho in singing and performance duet. She currently works in solo and duet projects for the three next years. As protests, indigenous voices, walks and social movements were her favorite and main topics, she gazes now into traditional songs and Innu animism for the rebirth for social awakening.